Rhapsody Magazine is United Airline’s premium magazine exclusively for first class and business class customers, and, visitors to the United Clubs and United Global First lounges. 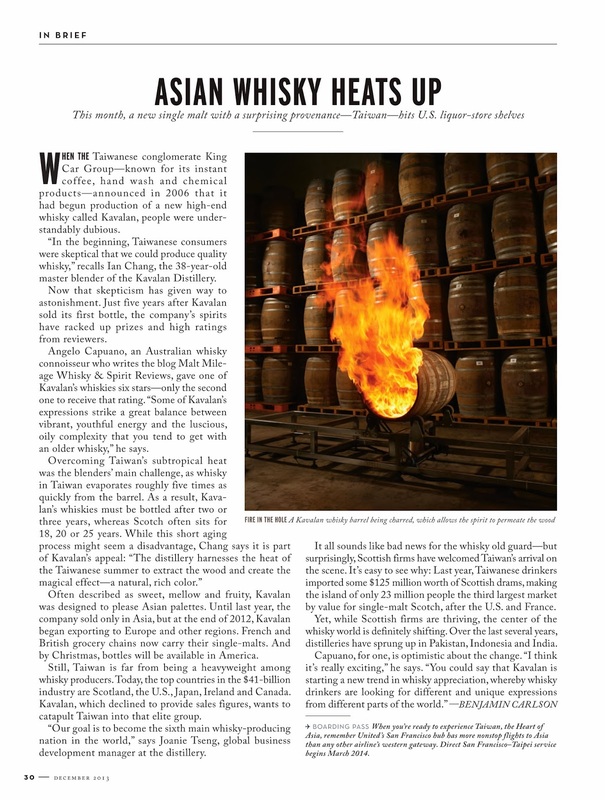 In the December 2013 issue Malt Mileage discusses the Taiwanese whisky sensation, Kavalan – producer of some of the most impressive whiskies we have blind tasted here on Malt Mileage. Despite their age, the most impressive among them offer some of the character that some older whiskies tend (not always, tend!) to exhibit in our tastings (complexity including lots of depth, lusciousness and a rich oiliness on the palate that follows a more dense aromatic nose) but with a distinctive Kavalan twist, a buzzing energy that is almost electric and no noticeable mustiness. We are big fans, especially of the Solist range. This entry was posted in Media and events, Uncategorized. Bookmark the permalink.